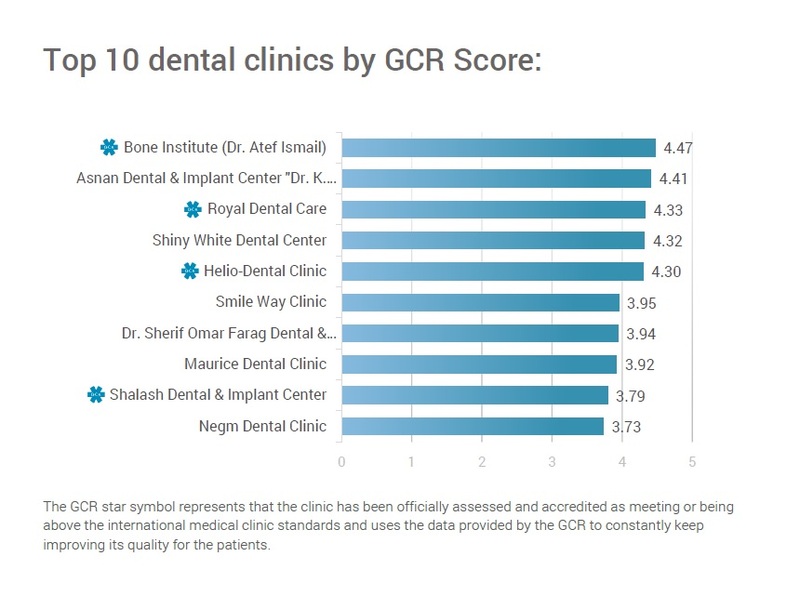 According to the GCR’s latest analysis of TOP 10 Dental Clinics 2018 in Egypt, Bone Institute (Dr Atef Ismail) ranks as the leading clinic in Egypt, when it comes to overall international clinic reputation. A total of 441 dental clinics were included in the study. The average GCR dental clinic quality score was 2.73, demonstrating the huge range of rising healthcare standards available in the country. The GCR – Global Clinic Rating, the leading provider of healthcare clinic ratings worldwide, aggregated and analyzed dental clinics throughout Egypt during 2018 including dental clinics in Cairo, Alexandria, Giza, and other cities. Bone Institute (Dr. Atef Ismail) ranked #1 with a GCR Score of 4.47, and ranks #24 from 125,890 dental clinics monitored worldwide, followed by Asnan Dental & Implant Center “Dr. K. Bakeer” (4.41) andRoyal Dental Care‎ (4.33). It is important to mention that all of this three clinics came out almost top (4.4-4.9) for their Feedback Score. The GCR Scores may change daily, depending on what has been recently changed within clinics’ expertise, facilities, services and patient feedback. Every little change in the clinic’s profile can affect the overall GCR Score of that particular clinic. The country’s economic struggles and political instability affected the country during the last couple of years, but not enough to take a toll on its medical tourism industry perception for the region. They currently have better-cost advantage versus other countries in the area, while also taking advantage of its reputation as a historic and resort destination. Finally, the country needs to work on its international accreditations and the quality of its medical staff, because even though the facilities and service quality dimension are quite good, it is still way behind the scores of Dubai and Abu Dhabi, which are the two kingdoms ahead in the region. Download the GCR’s full report Top 10 Dental Clinics in Egypt (English Speaking) to discover the names of the other dental clinics that made it to the Top 10 dental clinic list in Egypt and to find some brief statistics of these clinics.